Our favorite Salsa gets an upgrade with this BLACK BEAN VEGGIE QUINOA SALAD. If you’ve followed me a while, you know one of our favorite snacking and entertaining foods is a Black Bean Veggie Salsa that we serve alongside a big bowl of tortilla chips. 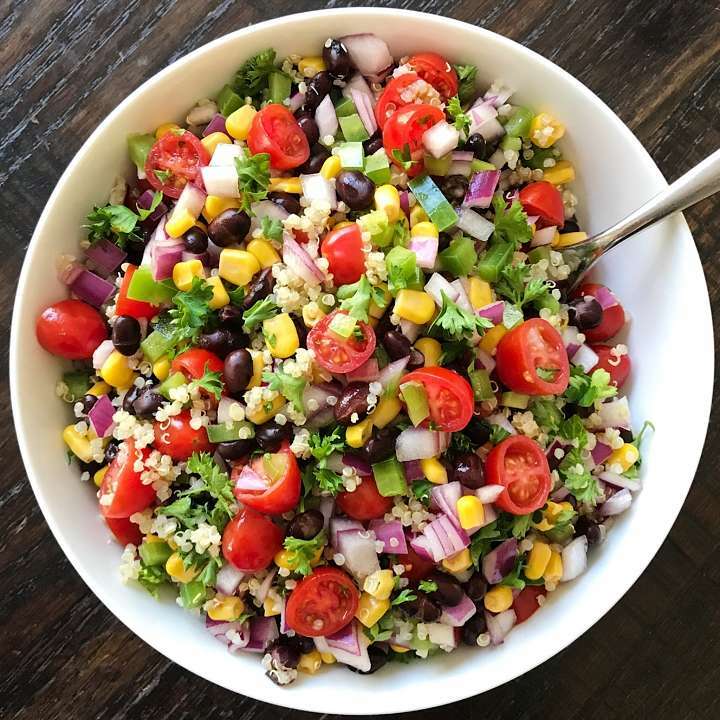 This fresh and yummy salsa can easily transform into a fresh and hearty salad by simply adding quinoa. The Salsa is super quick and easy, it takes merely minutes to assemble. It is simply Black Beans, Corn, Green Pepper, Red Onion, Tomatoes and Fresh Parsley all mixed together and seasoned with Rice Wine Vinegar, salt and pepper. Now just add quinoa at a ratio of 2 cups salsa to 1 cup quinoa for an amazing salad. So if you’re looking for a quick dish to bring to a party or enjoy on your own (can anyone say meal prep? ), make a big batch of salsa, a batch of quinoa and mix them together when you’re ready to eat. An fresh, hearty and delicious salad perfect for anytime! t's gluten-free, vegan and couldn't be easy to put together. Start with our go-to Black Bean Veggie Salsa (also great with chips!) and mix it with Quinoa. Stores well in the refrigerator for several days. Made this for lunch today and both me and my husband loved it! I added some lime juice, and it was delicious. So happy you love it too! Lime juice is a great idea– I bet that tasted delicious! One of our favorites! So happy you love it! Very fresh and healthy! Quick to put together which I love! Having this for lunch all week over some arugula! YUM!